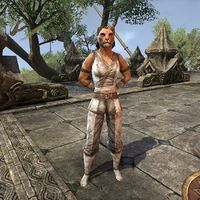 Dog-Bite-Me is a Khajiit smith found at the Temple of Two-Moons Dance, instructing the students with Inisashu-jo. She originally joined the temple after her brother was killed by Crosstree Bandits, looking for revenge. However, they taught her to temper her sense for vengeance with justice until she was ready. She in turn taught this to Hinaamo and set him on his own path. When talked to, she'll only say, "Please, leave us to our training." Dog-Bite-Me: "Keep your tails balanced!" Dog-Bite-Me: "Smooth, arcing motions. Let your tide roll in!" Dog-Bite-Me: "Back straight, arms limber! Palms open as the full moon!" Dog-Bite-Me: "As the moons move below the horizon, so must you follow through." Dog-Bite-Me: "Feel your surroundings! Let them guide your fists home!" Dog-Bite-Me: "Balance, balance! Do not overextend!" Dog-Bite-Me: "Your motions must be as inevitable as the coming tide!" Dog-Bite-Me: "Flow through your enemies and you will wash them away!" This page was last modified on 8 March 2019, at 10:15.